Winter is fast approaching, and with it the joy of slow-cooked stews. It is well worth investing in a set of casserole dishes that can be used either on top of the stove or in the oven. Most of them these days have a facility for setting a predetermined cooking time. This is ideal for stews and casseroles. With a little planning you can create a delicious family meal. Prepare a meal the night before, store overnight in the refrigerator, then place in the oven and set. When you get home you will have a delicious meal, what could be easier? At Wickedfood Cooking School we use our own raw or hot smoked Chorizo in our cooking classes. This recipe, from our cookbook of the week’s author’s website, is perfect for casseroling (see afoodieliveshere.com for more of Sarah Graham’s recipes). 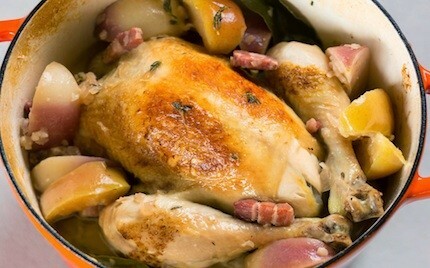 A spicy robustness of the chorizo, blended with the silkiness of the slow-cooked onions, and comforting roast chicken pieces, with the punch of the cider to round it all off. A real one-pot meal. The whole dish can be made a few hours in advance and re-heated under the grill just before serving. Pre-heat oven to 180°C. Season the chicken pieces with salt, pepper and the thyme. Heat an oven-proof casserole on the stove, add the olive oil and butter and brown the chicken for about 3 minutes on each side. Remove and set aside. Add the onions to the pan, fry for about 3 minutes, stirring often, and then add the garlic and chilli, and fry for a further 2 minutes. Add in the chorizo, cook for about 3-5 minutes. Remove the pot from the stove, add the chicken back in on top of the onion and chorizo, pour in the cider, put the lid on the pot and place in the oven for 40 minutes. Switch on the oven’s grill setting, remove the pot lid and grill for about 5-10 minutes to crisp the chicken skin. Sprinkle with fresh parsley, serve onto warmed plates and enjoy. Serve with creamy sweet potato mash. Wickedfood Cooking School runs cooking classes throughout the year at its purpose-built Johannesburg cooking studio. Cookery classes are run in the mornings and evenings 7 days a week (subject to a minimum of 12 people). This team building venue is also popular for corporate events and private functions – teambuilding cooking classes, birthdays, kitchen teas, and dinner parties with a difference. Our cooking lessons are hands-on, where every person gets to participate in the preparation of the dishes. They are also a lot of fun where you not only learn new skills, but get to meet people with similar interests. For corporate groups and team building cooking classes these events are a novel way of creating staff interaction or entertaining clients.